The paper provides a quick and simple way to calculate the out-of-balance voltages (voltage protection) or current (current protection) resulting from failed capacitor units or elements. While the identification of faulty capacitor units is easy with an externally fused bank, it is more complex with the other types of fusing, making maintenance and fault investigation difficult. This paper presents a novel method to identify the faulted phase and section in capacitor banks. Shunt capacitor banks are used to improve the quality of the electrical supply and the efficient operation of the power system. Studies show that a flat voltage profile on the system can significantly reduce line losses. Shunt capacitor banks are relatively inexpensive and can be easily installed anywhere on the network. 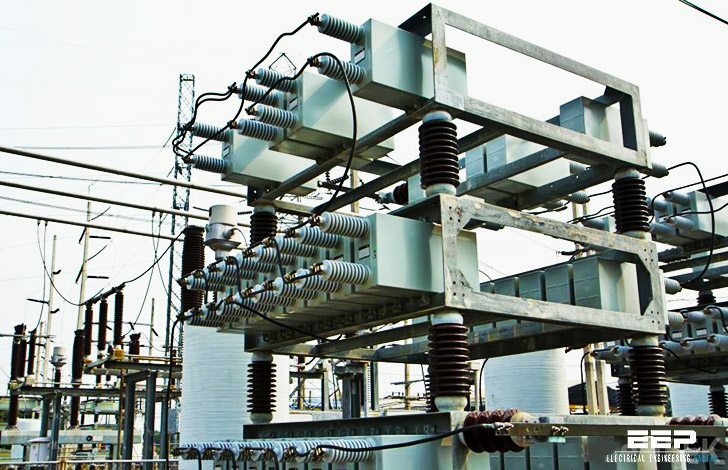 This paper reviews principles of shunt capacitor bank design for substation installation and basic protection techniques. The protection of shunt capacitor bank includes: a) protection against internal bank faults and faults that occur inside the capacitor unit; and, b) protection of the bank against system disturbances. Section 2 of the paper describes the capacitor unit and how they are connected for different bank configurations. Section 3 discusses bank designs and grounding connections. Bank protection schemes that initiate a shutdown of the bank in case of faults within the bank that may lead to catastrophic failures are presented in Section 4. The paper does not address the means (fuses) and strategies to protect individual elements or capacitor units, nor the protection of capacitor filter banks. System disturbances and basic capacitor bank control strategies are also discussed. Shunt capacitor banks (SCB) are mainly installed to provide capacitive reactive compensation/ power factor correction. The use of SCBs has increased because they are relatively inexpensive, easy and quick to install and can be deployed virtually anywhere in the network. Its installation has other beneficial effects on the system such as: improvement of the voltage at the load, better voltage regulation (if they were adequately designed), reduction of losses and reduction or postponement of investments in transmission. The main disadvantage of SCB is that its reactive power output is proportional to the square of the voltage and consequently when the voltage is low and the system need them most, they are the least efficient.